At 6am. I was in the shower, trying to get warm because the MR had THE AIR CONDITIONER on last night! I was also breathing in the steam and hoping it would clear my head....of the sicky kind of stuff- not the images of me doing something mean to him for making me freeze last night..
My classroom door is a little to the right of the large tree. It's placement will be significant in a moment. And I start making up this song about how I HATE, LOATHE, DESPISE Bradford Pear Trees! Your "fluffiness" looks so cool. And make it look as if it's snowing. Our eyes glassy and glowing. and fills my room with "Spring"
And I'm tired of rubbing my eyes. (And it's not making me very nice). Just let the wind carry your blooms far away. And I can't take another sick day. So I typed it, and then sent it to my Schoolio-s----because we ALL carry great disdain for this tree that brings so much trouble! Ok, so it is more like a grape...but grapes ARE fruit....you get the idea! There is some sadness in my day. My second favorite pair of WMDs have been banished to the porch! They aren't even allowed inside anymore.....don't they look sad out there in the cold? What if someone steals them? What if the wind blows them away? What if a creature carries them off? Who am I kidding.....they are like ADT out there....they are keeping folks at a distance! I am trying to get a good pic of me to post.....so I was "schmoozing" for the camera....by myself...in my classroom the other day. He stomped off and told his brother that "we are never leaving! ".....Can you feel the love? Staci has some awesome stuff that is DYING TO be given away! BUT she won't do it until she reaches 100! She is 6 away!!!!! So quit reading this! And I am not just saying this because I want to win, I can't win....she has asked me to participate!!!! girl I think your meds have already kicked in but your tree poem/song is hysterical and I am glad to know I am not the only one that takes 742 pictures of myself hoping that I will find a good one while my kids stomp their feet in disapproval. Good times. Hope your sleep helps your allergies!!!! Your song is fantastic! Much better than the freebie song I just posted. We have a plum tree at home that has an overpowering scent that sickens me while it is blooming. Glad it doesn't waft in my classroom through a vent like yours. Those WMD do look sad but I'm glad they are keeping your family safe from all the evils of the world. And don't get me started on the kids after school asking when we are leaving. Can't wait to see the picture. BTW, I missed what ended up being in the box for your birthday. LOL! You are hysterical. I loved your comment about stop making appointments. Oh if only I could! I used to use post its but when my middle got sick the posts were getting to tall. I had to relocate them all but get this... I have stickies stuck to my ipad. It happens when I forget the ipad so I just write it down and stick it in the case when I get home. Drives hubby nuts! My boys would recommend a drive by chain-sawing to resolve the tree issue. Oh and they refuse to be around when I take photos. They claim it is worth even trying! My boys- 8 and almost 11- affectionately call me "Oldilocks"
You are so funny! I can always count on a good laugh when I read your posts! 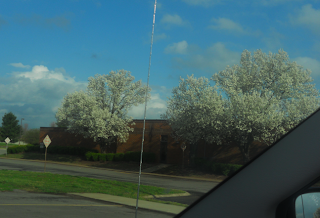 I hope the Bradford Pear blossoms blow in the opposite direction for you today! Yes, my sense of humor is really adolescent, but I love the word poop, too. I'm going to have to find a way to work it into a blog title. I checked out Let's Teach Something and pulled a really good idea right away! Bummer about those trees and allergies. Does it let up after awhile? You are hilarious! I understand the pollen thing. We have cedar trees in Texas and they make me so miserable! I itch, my face turns all red, I can't breathe, I lose my voice....YUCK! Loved the title of this post! I LOVE THAT WORD! I laughed for like five minutes straight when I read your comment......I REFUSE TO GROW UP!! !